An interesting and awkward family moment was on display last night at the Oscars. 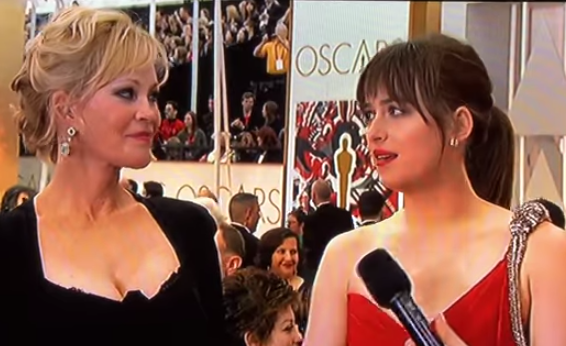 Dakota Johnson took her mother to the Academy Awards. Melanie Griffith, an actor in her own right, to everyone's surprise had not yet seen her daughter's first starring role. What follows is a partial body language analysis. 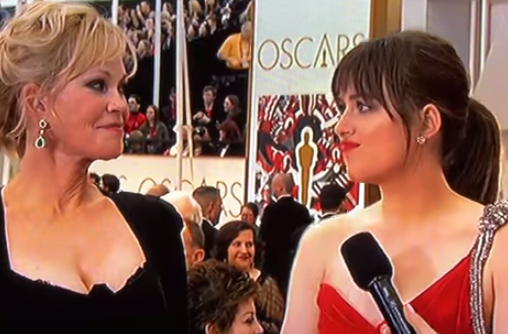 Just as Melanie is asked if she has seen "Fifty Shades of Grey" - Dakota begins to display an "Inward Lip Roll" (ILR). She knows what her mom's answer is going to be and the inward lip roll is (subconsciously) partially suppressing her negative emotions - as well as a more dramatic facial expression (0:36). A close up of the ILR as it wanes (0:37). Dakota is pleading to her mother with mild fear face and elevated central forehead contraction (CFC). This one expression very commonly used when trying to engender empathy in another. Melanie is tight-lipped, nonverbally projecting, "I don't want to say it ...."
As Dakota says, "Alright! You don't have to see it [inaudible]" - she displays a Subtle Eye Roll - which projects both her Contempt & Dismissive feelings. Meanwhile Melanie's mouth is configured in a Tight-Lipped False-Smile while her mid-face is also manifesting Disgust. 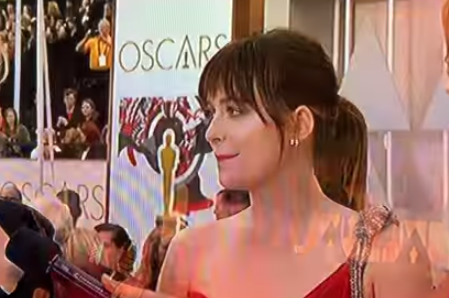 Dakota then Melanie each then turn their heads (and Dakota her back) away from each other - signaling dissociating, distancing, disliking and disagreeing emotional tones. Dakota is displaying a forward lip purse when her mother says, "If she tells me to see it, I will go see it." Lip pursing, in this cluster-context, is a strong nonverbal signal of clandestine disagreement. Dakota does not at all believe her mother will watch her break-out movie. Dakota is also projecting disgust. Johnson's partial eyelid closure here is an amplifier of her both her disbelief and disgust.